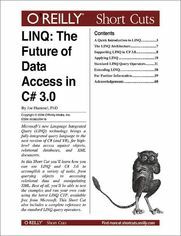 Language Integrated Query (LINQ) is Microsoft's new technology for powerful, general purpose data access. This technology provides a fully-integrated query language, available in both C# 3.0 and VB 9.0, for high-level data access against objects, relational databases, and XML documents. In this Short Cut you'll learn about LINQ and the proposed C# 3.0 extensions that support it. You'll also see how you can use LINQ and C# to accomplish a variety of tasks, from querying objects to accessing relational data and XML. Best of all, you'll be able to test the examples and run your own code using the latest LINQ CTP, available free from Microsoft. This Short Cut includes a complete reference to the standard LINQ query operators.